There is no surviving contemporary portrait of either Constantine or Sphrantzes, but this modern one seems quite convincing, and though I would not opt for a flowered silk for battle, it does appear that Sphranzes is wearing the green gown he was given by Constantine when he was rescued from prison at Patras. 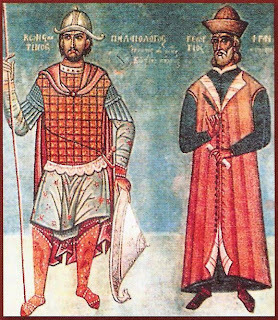 At the beginning of his wonderful account of his life, he identifies himself as "the pitiful first lord of the imperial wardrobe" -- πρωτοβεστιαρίτης. He was seventy-six or so then, living as a monk, and suffering miserably from rheumatism. The last of his book speaks of death: Demetrios Palaiologos, his daughter Helene, his wife Theodora. Cardinal Bessarion. Thomas Palaiologos' daughter Helene. His friend from childhood and spiritual brother, Joseph. He himself was so ill in his last two years as to have been given last rites three times, and even though "I escaped death, I remained deaf for a long time; I could not even hear bells tolling next to me." He wrote a book to record his world forever lost, a world where wardrobes were important. So Kontoglou's green gown is important. The title of protovestiaritis had little to do with being a valet and much to do with indicating that the bearer was physically close to the emperor, essentially all the time. Sphrantzes was close to three of them. When he was sixteen and a half, Manuel had put him in charge of his chamber. Sphrantzes had grown up at court, his father was Thomas' tutor, his uncle was Constantine's, and he and his cousins had been the imperial playmates and aides. While we nowhere get a sense that Manuel was affectionate to his sons, we do see -- in Sphrantzes' telling -- a great deal of fondness for the boy. In fact, Manuel was easier with the young Sphrantzes than with his own sons, and Sphrantzes could get favors for Contantine that Constantine could not get for himself. Manuel had a chest Sphrantzes coveted, one that had belonged to his own father, John V. Manuel had said he wanted to give it to his son John, but then, when he gave Sphrantzes the robe lined with fur, he gave him the chest, too. When Manuel was ill and making provisions for his will, he spoke to his wife and sons specifically directing them to care for Sphrantzes and reward him has he had not been able to. Sphrantzes liked clothes, paid attention to them, at least where he himself was concerned. The clothes of others are unmentioned. Manuel gave him a caftan -- kavadi -- a dark one lined with fur, and directed that he be given a green robe. The "new empress" Sophia of Montferrat, sent it to him, saying it was for his future wife. The position in Manuel's chamber allowed him to become knowledgeable about fabrics, if he had not been already. 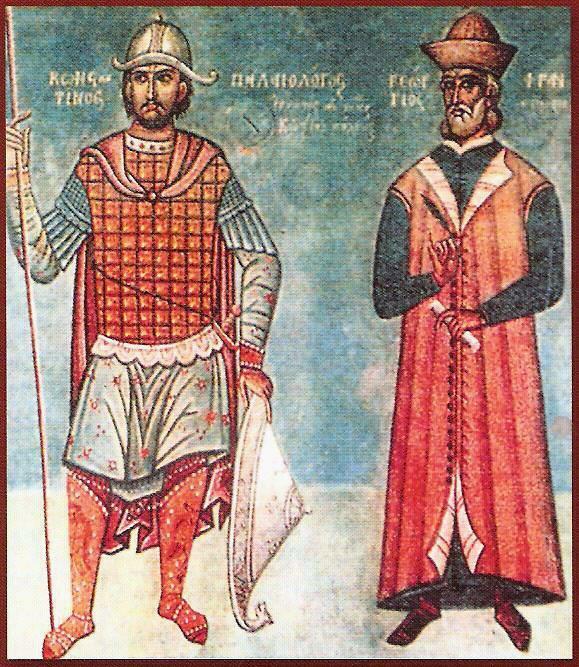 When he describes his gifts from Constantine at Patras, he identified the "expensive double green tunic lined with fine green linen" as from Lucca, the red cap embroidered with gold with a silk lining from Thessaloniki, and the heavy gold-colored caftan from Brusa. There was also a green coat, but its fabric is unspecified. He presents himself as Constantine's confidant, but I suspect Constantine never confided completely in anyone. He doesn't specify his abilities, but the long list of embassies -- and entrusting him to select a wife -- indicates Constantine's estimation of him It is significant that each place Constantine ruled, Sphranzes was given the highest administrative position: when Constantine was despot in the Morea, Sphrantzes was governor -- κεφάλη -- of Patras; when Constantine was despot in Selybria, Sphranzes was κεφάλη of Selybria; when Constantine was despot of the Morea at Mistra, Sphrantzes was κεφάλη of Mistra. His job description was put succinctly by Constantine: "You are to govern your command well. You are to put an end to the many instances of injustice and reduce the power of the numerous local lords. Make it clear to everybody here that you are in charge -- μόνον ἀρχὴν -- and that I am the lord --μόνον αὐθεντην." Constantine gave him the highest title in the court, after those given within the imperial family, that of μεγασλογοτθέτης -- but it is not the one he uses to identify himself. A certain touching jealousy about his dignity and titles can be read in a telling three-way exchange he had with Constantine and Loukas Notaras. Sphrantzes was a serious little man, and, I think, lonely. His book is erratic in what it tells and what it doesn't tell. He is deeply respectful of women, so respectful, that he does not expose them to our common gaze, except that he does say that Constantine's wife Theodora was really lovely. But he knew Sophia of Montferrat, he knew Cleofe Malatesta, and he might have left us something about them. Or about Helena, wife and mother of emperors. Or about his wife. Or about a lot of other things. "I was taken prisoner; I had sustained multiple wounds and was thrown into the dark tower of a house, full of ants, weevils, and mice, as it was located in front of the grain storage. I was put in secure irons and my leg was held by a strong chain, which was attached to a big post." "The holy emperor and his sons were waiting with a boat . . . When Mehmed embarked they greeted each other from their respective boats and carried on a conversation until they reached Skoutari . . . Mehmed landed and went to the tents that had been pitched for him. The imperial family ate, drank, and sent food to each other on the boats until they sailed home early in the evening . . ."
"On January 15, 1470, so much snow covered the whole island of Corfu as no local inhabitant had ever seen. It was even possible to catch foxes and hares by hand." Most of the quotations are from Marios Philippides, The Fall of the Byzantine Empire: A Chronicle by George Sphrantzes (Amherst, 1980). Great story by a wonderful narrator. Unfortunately it seems the book by Philippides now can't be found for much under $200. Bookfinder.com has more listings of it under Sphrantzes as author than under Philippides.